Preparing graduate students to become the next generation of leaders. Graduate training is an important aspect of the Anita Zucker Center. 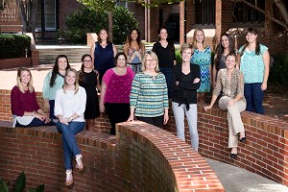 Beginning in 2015, a five-year grant from the U.S. Department of Education provides scholarships for 12 graduate students each year in early childhood special education. Project Prepare is designed to train and prepare students to become the next generation of leaders by working with young children with disabilities in high-need communities. Fifth-year students in the college’s Unified Early Childhood Program will be mentored by internationally and nationally recognized core faculty members throughout the one-year training program. By providing each student with a $13,750 scholarship, they will have the opportunity to further their education while making a real difference in the quality of early learning services young children receive. Students who participate in the program are required to teach children with disabilities for two years, and will be evaluated based on child progress and employer and family satisfaction. Qualified students enrolled in the Unified Early Childhood Program with a record of superior academic performance and experience in the field are encouraged to apply for this scholarship opportunity by January 2017.